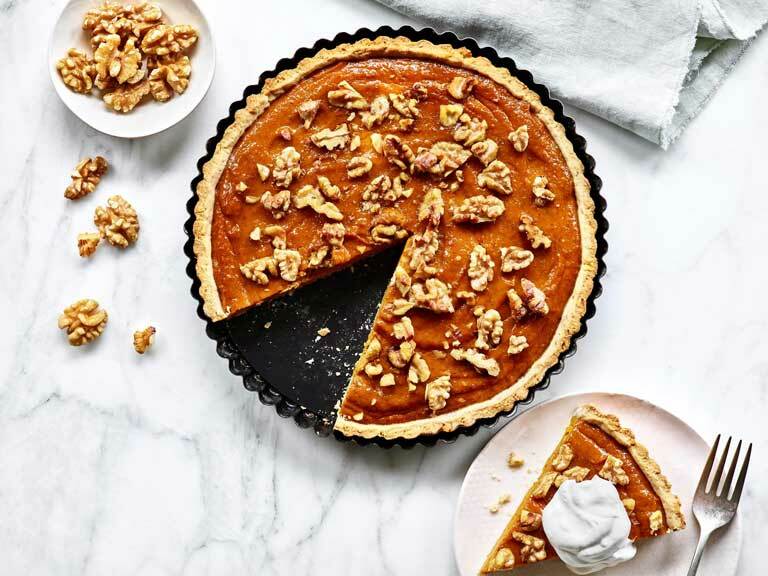 This smooth and creamy tart with a flaky walnut pastry crust makes a lovely luxurious Halloween or autumn dessert. 1. Preheat the oven to 180°C. Lightly grease a 9-inch round tin with a loose base with butter. 3. Place the pastry dough onto a lightly floured board and roll out into an 11-inch circle. Press onto the bottom and sides of the tin and poke the pastry with a fork. Bake for 20 minutes. 4. While the crust is baking, whisk together the pumpkin and cream cheese in a bowl until smooth. Add the light brown sugar, pumpkin pie spice, vanilla extract, the egg and the egg yolk, and beat until just combined. 5. Pour the mixture into the baked crust and top with California walnuts. Bake for 40 minutes or until the filling is set when the tin is gently tapped. 6. Remove from the oven and let cool. Cover and refrigerate until ready to serve. 7. When ready to serve, top each slice with a dollop of whipped cream.